There is a lot of excellent information available online regarding the why’s and how’s of proper mulching. We often refer our clients to this PDF published by the International Society of Arboriculture. We won’t cover the same material here, but we will give you some real examples from around the Pioneer Valley. 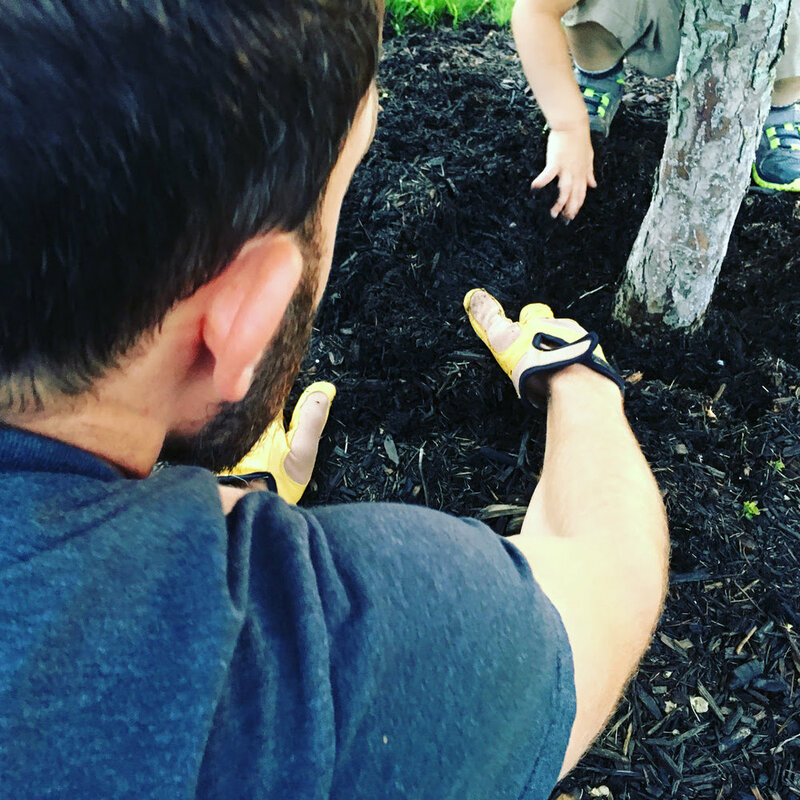 In fact, it was a recent trip to the Hampshire Mall in Hadley, MA that prompted us, yet again, to think about the importance of proper tree mulching. We spotted mounds of mulch, piled up around the trunks of all the trees in the parking lot. You have surely seen this yourself, especially outside new construction buildings (looking at you, Greenfield Savings Bank, on King St in Northampton! ), and in your neighbors’ yards. While mulch has many excellent benefits for trees, when done incorrectly it can actually be worse for the tree than no mulch at all. Why? It invites many different soil, insect, disease, and growth problems. About one year ago, our family was having dinner in Chicopee and saw a crabapple suffering under the volcano mulch. It was slowing dying, as you can see in this picture below. With my son as my helper, we did some digging to rescue the tree. Good thing we had some gloves in the car! This crabapple had been buried for a while. Its primary root system rotted away (this is called root rot), and a second root system took its place. You can see the secondary root system that grew on the trunk, in the black area we uncovered. This is how deep the trunk was buried, completely unnecessarily. The Chicopee crabapple we previously dug out of the volcano mulch. Looks much better now (taken 2018), despite new volcano mulch added this spring. Crabapple next to the one we unburied a year ago (taken 2018), slowly dying. Now let’s go back to those trees in the Hampshire Mall parking lot and do a closer inspection. You can see the structural defect in the trunk (above), about a foot from the top of the mulch pile. And even at the very base, buried partway into the mulch, you can see more areas of rot caused by improper mulching. Not only does this leave the tree more susceptible to disease and pests that will attack a weakened tree, but it will eventually become a safety issue. The trunk and base are compromised, which means that adverse weather conditions, such as high winds, heavy rainfall, etc., could cause the tree to fail. Whether that’s in the next 5 years or 10 years, we don’t know, of course. Fortunately this tree is not very tall, but it is in a high-traffic public space, and it should be monitored closely to prevent any damage or injuries. We hope these examples are helpful in understanding the importance of proper mulching. While the effects may not be immediate and dire, they are serious and affect the long-term health of the tree. For homeowners, this can affect your wallet and your property value, too. We strongly recommend you do your trees and yourself a favor, and just say NO to volcano mulch. Want to get mulch rings properly installed for your trees? Give us a call at 413-835-6052, and our ISA Certified Arborists will be happy to assist you. Gypsy moths can be a big, hairy nuisance on your trees in the summer, eating leaves and raining down poop on your house, driveway, lawn, car — and your head if you pass beneath! If you hear rain, and it’s not raining, that’s caterpillar poop. In 2017 Massachusetts experienced a gypsy moth population boom, and this invasive pest defoliated 923,000 acres statewide, according to the DCR. This year, while not as severe, the problem persists. Locally, we’re seeing this in parts of Amherst, Pelham, Belchertown, Granby, and eastward. Oaks are the preferred feast for gypsy moth caterpillars, but they will also feast on maple trees, birches, apples, willows, poplars, and hawthorns. Even healthy trees will be at risk after two or more years of defoliation, and susceptible to disease and other opportunistic pests that will attack the trees in their weakened states. To avoid the cost of removing dying or dead trees, and the loss of their value on your property, there are several actions you can take against these pests. How can you protect your trees from gypsy moth infestations? First, know how to identify gypsy moths throughout their life cycle. The larvae emerge in early May, depending on the weather conditions, and start to eat the leaves. Toward the end of June, the caterpillars will pupate, and the adult moths emerge by mid-July. Buff-colored egg masses are laid in early August; you can see them not only on trees but on other surfaces outside (house, car, furniture, etc.). Observation of gypsy moth populations on your property is important, and if significant populations are noted there are several options for treatment that we recommend. Scrape egg masses off in the winter months. This will help reduce populations, though it won’t eradicate them completely. B.t. insecticide spray: Bacillus thuringiensis (var. kurstaki) is a bacterial pathogen that is toxic only to larvae of moths and butterflies. We can do a foliar application of the bacteria in the spring when the caterpillars are still small. The larvae eat the leaves, ingest the bacteria, and die. But it is not 100% effective, since you must rely on the caterpillars to eat the leaves that were sprayed, and many trees are too tall to reach the tops. However, it is a completely non-toxic control option to reduce populations for a season. Lepitect infusible: If you’re looking for a stronger alternative, this chemical treatment is injected directly into the trunk of the tree and taken up into the tree’s vascular system. Results are very positive and longer lasting (about two years of control), and the injection method is environmentally friendly, posing no toxic threat to kids, pets, or wildlife. Do you have gypsy moths on your property? Schedule a quote with Lyndon Tree Care & Landscaping for safe, effective treatment of your trees. Give us a call at 413-835-6052! What is killing my dogwood tree? Hello Pioneer Valley, this week’s discussion will revolve around our native dogwood trees and how we can protect and preserve those lovely blossoms we see and cherish every spring. They are a very delicate species of tree that are susceptible to a very aggressive pest: the dreaded and feared Dogwood Twig Borer. The dogwood twig borer attacks a few other host trees as well such as elms and viburnums and a few fruit trees like cherries and apples. This is important to keep in mind if you have these species on your property as well. Now lets talk of how this pest damages our cherished Dogwoods. It is very similar to that of the Bronze Birch Borer, where the larvae tunnel through live wood. However, the dogwood twig borer, feeds its way through twigs and down the center of the twig. This leaves the twig to be hollow which rapidly increases rate of decay in the branch. There are a few treatment procedures out there to control this pest. However an extremely cost effective treatment that we can do for you is prune the deadwood and thin the sucker growth. This simple and holistic approach is effective for minor infestations only. If you have a heavy infestation, to eradicate this pest and potentially save your precious heirloom tree, we at Lyndon Tree offer a foliar applications and systemic applications to kill all twig borers located throughout the tree. We hope that by providing these options, you have well equipped you to defend your Dogwoods so that you may enjoy the radiant blossoms, while relaxing on your porch. If you need help in pin pointing or utilizing proper pruning techniques to control this pest, we are always a phone call away to help. Thank you for taking the time to share our love for trees and to increase your understanding of pests that plague our Dogwoods. We are quickly approaching the best time of year to provide proactive care of trees by spraying dormant oil as we enter late winter and early spring. Dormant oil is a natural way to protect trees from overwintering pests, larvae, and eggs. Here at Lyndon Tree Care & Landscaping, we want to give you some guidelines we follow on how to use dormant oil and explain the process to you. While dormant oil can be used on many different plants, we focus on hemlocks and fruit trees in our area of western Massachusetts. Hemlocks can be very susceptible to hemlock woolly adelgid (HWA) and elongate hemlock scale. These two insects can cause significant damage and even kill hemlocks in a matter of years. Spraying dormant oil is a great way to reduce the population before it becomes an infestation, which is much more difficult to combat. Helping to maintain the overall health and well-being of your trees is recommended in tandem with this spray. When the oil is sprayed on the trees before the buds begin to swell, it suffocates the insects and their eggs that nest in the branches. Fewer hatching eggs means fewer insects feeding on and damaging the tree. Spraying dormant oil won’t completely eliminate the pests, but it will significantly minimize future damage. Pruning storm damage breaks and deadwood, making sure the tree has enough water in droughts or dry months, and fertilizing (with the exception of nitrogen) will all aid the work of the dormant oil treatment to increase the tree’s chance for survival. Timing for dormant oil spray is weather dependent. The spray should be applied before the buds on the trees haven’t begun to swell, but not if the temperature is below 40 degrees F for at least 24 hours. Wind and rain also impede application, so a calm and temperate day is required. To the untrained eye, it can be very difficult to spot signs of infestation and poor health in plants and trees. But because pest populations thrive on weak and stressed plants, it’s vital to understand the overall health of your trees. In addition, you need to be aware of any infestations in neighboring trees, which could spread to other properties. We recommend that you call a professional arborist to inspect your trees for these threats and evaluate their overall health. Even if trees aren’t yet infected, being vigilant and proactive can help you cultivate a healthy, vibrant landscape that lasts. Lyndon Tree Care and Landscaping is happy to provide consultation services if you’re at all curious about the health of your trees and shrubs. We’ll give you a full run down and make recommendations if any interventions would be helpful. Contact us today! Originally posted at Mass Realty. Lyndon Tree Care has been operating in the Valley since 2010; we serve residents and towns along the I-91 corridor from Greenfield to South Hadley. Our ISA Certified Arborists specialize in the care of trees, from diagnosis to treatment and long-term planning for the property. Our company services include tree planting, pruning and removal, stump grinding, cabling, spraying and feeding trees, and landscaping. How do common practices such as trimming or pruning help keep trees healthy? Removing deadwood is very important for safety and health, as it gives the tree the opportunity to more quickly close over its wound. You also don't want to leave anything that's going to rot back into the branch or trunk. Trees should also be thinned out about every two to three years, so when storms come the tree is less likely to sustain heavy damage. Lastly, removing sucker growth allows the tree to avoid investing energy into branches it doesn't need, so the earlier those are pruned away, the better. What are some important maintenance practices that enhance the appearance of trees? Thinning out branches and "cleaning," or removing deadwood, gives trees a more defined structure. When you prune, you're basically telling the tree what to do, i.e., where to grow. That's why we prune: We have to train each branch to set the boundaries for future growth. Mulch rings are another great investment in tree health and aesthetics, because not only do they help keep in moisture and provide a temperature buffer, they help keep out mowers and weed-whackers that damage the roots and trunk. What are some common reasons for tree removal? There are many times quality maintenance can save trees on your property. Other times, they simply have to come down. Removals can be due to a compromised root system; extensive rot or disease; or growing too close to the property's structures or features, such your pool or home. Clients with wooded lots may also opt to strategically remove a few trees to get more light into the landscape and promote other sun-loving plants. What are some signs a tree is dying? Often the evidence can be seen from the top down; for example, die-back from the top of the canopy or significant leaf drop are signs of decline. If the tree has significant rot, or is cracked, the tree is not structurally sound and should come down even if other parts look very healthy. Fungus or insect damage is very common, signs of which could be mushrooms growing out from the trunk or underneath the tree (indicating decay in the root system). Early leaf drop before fall, or yellow or brown discoloration can also be signs of insect damage or nutrient deficiencies. How can trees be protected from harmful diseases? Thinning trees out is helpful to get optimal sunlight and wind through, since diseases establish themselves in trees that stay wet longer after it rains. In addition, our company does sprays and injections of fungicides and insecticides to combat specific threats. A few examples common to this area are needle cast, which is a fungus found on spruces, and hemlock woolly adelgid, an insect that kills hemlocks. If you don't catch these in time, or if neighboring trees are infected, it's often more cost effective to just remove the tree. Just as with people, preventative treatment is the most effective. Trees, like all plants, are alive and require nutrients to survive. But what happens to trees during the winter, and how do they survive the frigid cold? If trees consist of water, what keeps the water from freezing, expanding, and even damaging the tree like bursting pipes during the coldest months of the year? As a tree and landscaping company, trees are more than just our business—they are our passion, and we have lot of respect for their amazing abilities to thrive and stay alive when the odds are stacked against them. Because they can’t uproot themselves and migrate south to warmer clients like certain animals, trees enter a dormant state similar to the hibernation of snakes, bees, skunks, bears and bats (to name a few). This dormancy is what allows trees to survive the cold winter. During dormancy, a tree’s metabolism, energy consumption, and growth all slow down significantly in order to endure the harsh season of winter when water and sunlight are more scarce. Dormancy occurs in stages; it begins in the fall with the loss of leaves. A chemical called Abscisic Acid is released, which signals the leaves to detach so trees do not expend energy in keeping them alive during the winter. This occurs exclusively in deciduous trees (like maples and oaks), not coniferous trees (evergreens). During the winter months, the rate of growth is brought nearly to a halt. The stored energy is utilized to maintain the tree’s health, instead of being used for growth. Without cell division and growth, or the task of keeping its leaves alive, trees are able to survive through winter by maintaining only the “essential systems” until the spring. But, you might ask, what happens to the water inside of the trees? Won’t it freeze and damage the trees like bursting water pipes in a house? It’s true that trees, like other living things, contain a lot of water within their cells. But trees have some seemingly miraculous methods of coping with the extreme cold only observable under a microscope. Paul Schaberg, a research plant physiologist with the USDA Forest Service’s Aiken Forestry Sciences Laboratory in Burlington, Vermont, has led many investigations of cold tolerance in trees, particularly in the foliage of montane spruce and fir in New England. Schaberg’s work suggests three basic ways in which living tree cells prevent freezing. One is to change their membranes during cold acclimation so that the membranes become more pliable; this allows water to migrate out of the cells and into the spaces between the cells. The relocated water exerts pressure against the cell walls, but this pressure is offset as cells shrink and occupy less space. The second way a tree staves off freezing is to sweeten the fluids within the living cells. Come autumn, a tree converts starch to sugars, which act as something of an antifreeze. The cellular fluid within the living cells becomes concentrated with these natural sugars, which lowers the freezing point inside the cells, while the sugar-free water between the cells is allowed to freeze. Because the cell membranes are more pliable in winter, they’re squeezed but not punctured by the expanding ice crystals. The third coping mechanism is altogether different. It involves what Schaberg describes as a “glass phase,” where the liquid cell contents become so viscous that they appear to be solid, a kind of “molecular suspended animation” that mimics the way silica remains liquid as it is supercooled into glass. This third mechanism is triggered by the progressive cellular dehydration that results from the first two mechanisms and allows the supercooled contents of the tree’s cells to avoid crystallizing. All three cellular mechanisms are intended to keep living cells from freezing. That’s the key for the tree; don’t allow living cells to freeze. The bottom line is that trees can survive by allowing dead cells to freeze and by keeping living cells unfrozen. A large portion of the trunk of trees consist of dead cells—not useless cells, since they still assist with certain functions like the flowing of sap to keep the tree alive during the warmer months. But during winter, with energy and nutrient requirements being much lower, the dead cells can freeze with no ill effects to the tree itself. Even though trees do a lot to take care of themselves, that doesn’t mean we can’t help them. Lyndon Tree Care & Landscaping consists of certified arborists who can work with you to keep your trees healthy and vibrant. Call us today! Not many people think about pruning during the winter, but it can be one of the best times to do it. You don’t have leaves getting in the way and most of the plants are dormant. Keeping plants pruned can help them produce more flowers and fruit, and even ward off pests and diseases. Pruning also helps maintain the plant’s shape or improve its overall appearance. But the best reason to prune in the late winter while the plants are dormant is to provide a small window exposing the plant’s wounds which will encourage abundant growth when the growing cycle begins. WHEN EXACTLY SHOULD I PRUNE? Depending on where you live and what climate you live in, this answer will vary. There is a window that you need to work within that typically lasts a month to six weeks. Winter pruning should occur before the new spring growth occurs, but after the peak cold of winter. WHAT EXACTLY SHOULD I PRUNE? Summer Flowering Trees – Ornamental trees that bloom in summer such as Crape Myrtles, Vitex, Smoke Tree, Rose of Sharon. Hydrangea paniculata and H. arborescens – Unlike their cousin H. macrophylla, these two hydrangeas bloom on new wood so cut them back hard to promote growth and flowers. H. paniculata can be cut back to two buds above the base of the flower stem. Prune H. arborescens back to varying heights of 1 to 3 feet from the ground. Fruit Trees – Fruit trees flower on growth from the previous season, but pruning should be done when the tree is dormant, so there will be some flower and fruit loss. The good news is that pruning promotes vigorous growth and larger, better tasting fruits. Each type of fruit tree has some special requirements so do some research before you begin cutting. Roses – Hybrid tea, old-fashioned, and climbing roses should be pruned right before the leaf buds break or, if you live in a northern region, pruning should be done when you remove winter protection. Spring Flowering Shrubs – Forsythia, quince, azaleas, Bridal wreath spirea, and other shrubs that bloom in spring should be pruned immediately after they flower. Spring Flowering Trees – Lilacs and ornamental fruit trees. Once Blooming Roses – Old-fashioned roses that only flower once each growing season, such as Damasks and Mosses bloom on old wood and should be pruned in the summer after they have flowered. Being proactive about pruning can yield some fantastic results in the spring time. If you’re not sure where to start, or if you just don’t have the time, it’s a good idea to contact your local landscaping or tree care professionals. If you would like to know more about how Lyndon Tree Care & Landscaping can meet your landscaping (specifically pruning!) needs during the winter, please don’t hesitate to contact us today! Thinking about hiring a snow plow service this winter? The numbers show that shoveling sends an average of 11,000 people to the hospital each year. A study from the American Journal of Emergency Medicine reports people suffering from bad backs, broken bones, head injuries (from slipping and falling on ice), and even fatal heart attacks. Luckily, finding someone to plow for you is relatively easy; many tree and landscaping companies offer this during the off season. Whether you’re looking to save some time or your health, here are some things you should consider when shopping around for a plowing service. Know what you’re getting and have it in writing. It’s important to have an agreement with your plow service so that there are no unwritten expectations for service. Contracts will lay out when companies will come (based on certain predefined amounts of snowfall), what exactly will be done, and any special considerations. Contracts will also address what happens in the event that there is damage done, and what type of insurance coverage a company has. It’s important to note that regular plow services often don’t leave you with a perfectly clear driveway and walkway. If you have a gravel driveway or uneven paving, you should expect small amounts of snow left behind (especially with wet, slushy snow). In this case, it’s best to have a plan for additional aids like salt or sand to take care of areas that can re-freeze and become slip hazards. In addition to clearing snow by plowing, some companies also offer snow blowing or shoveling services. You should decide whether you or your snow removal service will be responsible for clearing out entryways, decks, stairs to second floor entrances, sidewalks (see more on that below) and walkways. You can request snow cleared from other areas that require a little more care in order to protect your home and landscape, such as access to utility meters, exterior pipes or propane tanks, trash cans, etc. Tell us where to put the snow! It seems like a simple point, but make sure you let the plow company know where you’d like the snow to be pushed so that important things aren’t barricaded or covered, and to avoid wear and tear to any landscape features you’d like to preserve, like a garden bed or a stone wall along the border of your driveway. To get the best control over what gets plowed (and where), place markers on the edges of your driveway and walkways to assist your plow service. Pro tip: Remember to place the markers out before the ground freezes. We recommend you take this action before Thanksgiving, which is usually when we get the first snow of the season. Even if you don’t hire a plow service, just know that every homeowner is required to clear all sidewalks along their property within a specified window (usually 24 hours), or they may be fined. Each town and city has their own rules and regulations, so be sure to look up yours. Landlords in Massachusetts are also legally obligated to keep all egresses free from obstructions—which includes snow and ice, which pose significant slip-and-fall hazards. Lastly, don't forget your mail carrier! You’ll have to make a path to your mailbox that’s reasonably clear of snow and ice, or delivery may be delayed. Lyndon Tree Care & Landscaping offers full plow service with snow blowing and shoveling. Give us a call and we’ll be happy to clear you out of your driveway so you can be on your way. We also offer vacation-only service to take care of snow removal while you're away. Not only will it look like someone is home, but you will return to a clear driveway and path to your door. If you have questions or would like to sign up this winter, please click here. Each year, roughly 25-30 million real trees are sold during the Christmas season to be placed in our homes and decorated with lights and ornaments. Taking care of a tree throughout the season is important both for its beauty and your safety. Lyndon Tree Care & Landscaping is here to give you some pointers this season that will bring our tree service expertise indoors. Whether you cut your own tree down or buy a pre-cut tree, it’s important to cover the tree if possible with a tarp or rug. During travel the wind can further dry out the tree, leading to the loss of color and needles sooner. This is often a step that’s not taken but one that helps protect your investment. If you purchase a pre-cut tree in a line of other trees, chances are high that the tree has been standing there for quite some time. As tree care experts who spend a lot of time doing tree removal and tree trimming, we can tell you that the vascular system (which draws up water through the tree trunk) will naturally clog up. A fresh 1/4” cut will remove the clogged area and open up the vascular system of the tree, allowing it to fully absorb water. You might hear others saying that a particular cut at specific angles, or the addition of holes using a drill, will help with water absorption. As professional arborists, you can trust us when we say a straight cut is perfectly sufficient. Cutting a tree down is similar in some ways to picking a flower: you want to put it in water as soon as possible to make sure it gets what it needs in order to stay healthy for as long as possible. Most trees will be fine if you fill the stand with water within the first 24 hours, but your tree will stay fresh longer if you fill it as soon as you can. Depending on the size of the tree and the water reservoir, you may need to check on it twice a day (morning and evening). A tree with no water will dry out quickly and lose its needles. In addition to the mess, it will become a significant fire hazard in your home. Of course there’s the ideal aesthetic location for your tree, but there are other things that we, as a tree service dedicated to tree care, would encourage you to consider. Avoid placing your tree near cold drafts, heating vents, and other sources of heat. The fluctuating temperatures, and specifically the dry air from heat sources, can speed up the drying out of a tree. Want a couple tips from the pros? Get a humidifier for the room your Christmas tree is in. It will help keep the needles fresh for longer, as well as reducing the risk of fire. Plain water is fine for trees, but try adding some Epsom Salt to provide extra nutrients for your tree. Remember, having a Christmas tree is like a piece of your landscaping inside of your home. It requires care if you want it to last. Follow these tips and you’ll make it through the whole season with a beautiful tree. Merry Christmas from Lyndon Tree Care & Landscaping!